“Before you came, I owned the throne. They trembled at my slightest moan. 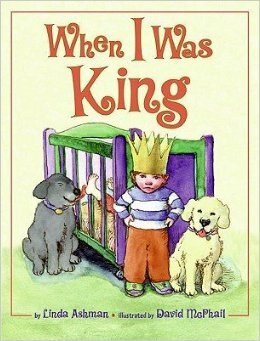 I was the star, the prize, the king. . . .
Welcoming a new baby brother or sister is not an easy thing to do. 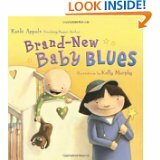 In this charming rhyme, an older brother complains and gripes about how things are different now that there is a new baby in the house. In the end, he decides the baby has some redeeming qualities…and perhaps he can share the throne. I promised to tell you about two other books that address the same topic. These were read for the Rhyming Picture Book Month challenge. They are well worth reading to your children. The first one has bold illustrations and a rollicking verse…the second has almost no words…a perfect book for your child to look at and tell YOU the story. Every child needs to feel special…how about making your child prince or princess for a day. We posted this activity recently, but it is totally perfect for this book as well. Here’s a quick and easy crown craft. You will need: Construction paper, scissors, markers, glue. Cut a strip of construction paper…fit to your child’s head. Cut points along one edge. Cut out jewel shapes from construction paper and color with markers. Staple the ends so the crown. Let the prince or princess decide what is for dessert and which story to read for bedtime. This entry was posted in Crafts for kids, Perfect Picture Book Friday, sibling rivalry and tagged Brand New Baby Blues, Crown craft for kids, Kathi Appelt, Linda Ashman, Mine!, Perfect Picture Book Friday, picture book review, RhyPiBoMo - Angie Karcher, Shutta Crum, Sibling Rivalry, When I was King by viviankirkfield. Bookmark the permalink. Even more reason to get him the book…I’m thinking about it for my older sister who just turned 70. 🙂 I appreciate your kind words, Marylin…glad you enjoyed the post! hahaha….. cracked up reading Marylin’s comment here. Great book choices, Vivian. So love the cover of Mine. Looking forward to your post on Susanna’s class. What a hoot! Love “When I Was King” and your other selections. One day my mother found me lying under my brother’s crib kicking the bottom and saying, “this is me bed.” Now that baby brother just made his transition in March. It’s good to be reminded of funny memories. Had forgotten that. Nice choices for sibling rivalry. You are building up quite a resource here. I’ll have to forward this to my sister, who just had a second baby. Let’s hope her daughter doesn’t play the queen. Why have I not read this Linda Ashman book? Looks like a great resource for new siblings. Love the activity. We need a crown in our house for someone … who things he’s king. Hahaha…yes, most of them think they are the king…and mom is one of the helpful minions who has the privilege of serving. 🙂 Hope you and Enzo get to make a crown. A hat trick of great books, Vivian! With your suggestion I am going to reread When I was King for poetry month. So glad I gave you some grist for poetry month, Wendy! 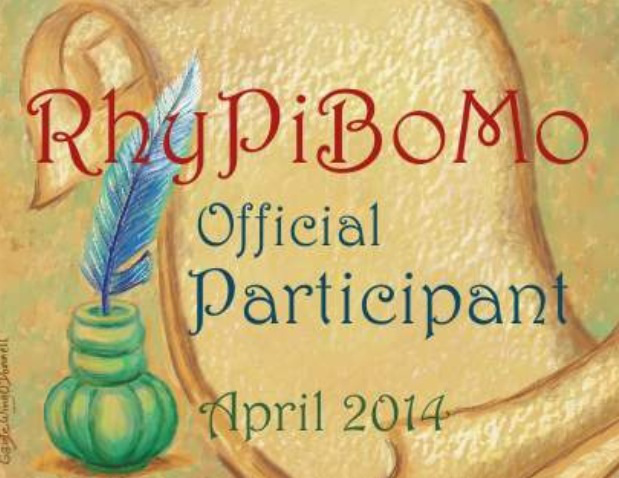 I’m doing RhyPiBoMo and my local library has supplied me with dozens and dozens of rhyming picture books…what a great month this is! I loved MIne when I read it last. I read a text blog on it and saw how the text was laid out with the illustrations all sparse and tight. So informative. 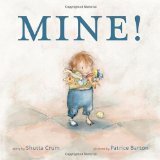 “mine” became a catchphrase for my kids (something about a seagull in a kid’s flick) – this is such an important topic…. esp for the oldest kid who really is Queen or King of the universe until those little usurpers pop into the scene. You always find such wonderful books to share, and I love the activities you find to complement them! Thanks for sharing this at Booknificent Thursday! Always love to see what you have to share!